The holy fathers always condemned themselves, having a realistic view of themselves before Almighty God. We should take note of their practice, and in this way avoid the traps of the devil. The evil one always strives to distort reality, so that we would commit sin. A brother asked Abba Poemen: “How is it possible for a man to avoid speaking evilly to his neighbour?” The old man answered unto him and said: “We and our brethren possess two images. Whensoever a man condemneth himself, his brother appeareth to him beautiful and excellent; but whensoever a man appeareth beautiful to himself, his brother will be found to be, in his sight, hateful and abominable”. One of the old men said, “When a man saith unto his companion, “Forgive me”, and at the same time humbleth himself, the devils are consumed. As true Orthodox Christians, we must know what is Orthodox and what is un-orthodox dogma and practice. And he came down with them, and stood in the plain, and the company of his disciples, and a great multitude of people out of all Judaea and Jerusalem, and from the sea coast of Tyre and Sidon, which came to hear him, and to be healed of their diseases; And they that were vexed with unclean spirits: and they were healed. And the whole multitude sought to touch him: for there went virtue out of him, and healed them all. And he lifted up his eyes on his disciples, and said, Blessed be ye poor: for yours is the kingdom of God. Blessed are ye that hunger now: for ye shall be filled. Blessed are ye that weep now: for ye shall laugh. Blessed are ye, when men shall hate you, and when they shall separate you from their company, and shall reproach you, and cast out your name as evil, for the Son of man’s sake. Rejoice ye in that day, and leap for joy: for, behold, your reward is great in heaven: for in the like manner did their fathers unto the prophets. The Ten Commandments given to Moses on Mount Sinai commanded what thou shalt do and what thou shalt not do, written on stone tablets, so as to be learnt by heart. The Beatitudes of the New Testament speak about blessedness and love, for inscription on the tablets of the heart of each person, by the Holy Spirit. The Greek word used is an adjective that means “happy”. The saints perceived that HAPPINESS could be attained both here and in the future life, by renunciation of sin and acquisition of the holy Spirit. All the Orthodox peoples and nations were foreordained and called upon to keep faithful under the harshest conditions of life that they might become “A CHOSEN RACE, A ROYAL PRIESTHOOD, A HOLY NATION, A PEOPLE FOR A POSSESSION.” (1 Peter 2,9). “From the days of Great Prince Vladimir, the Russian people with all its heart has accepted the holy Orthodox Faith. 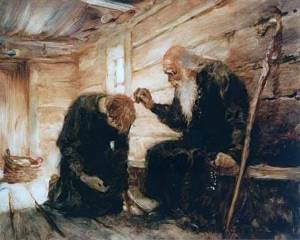 This faith inspired numerous holy princes, bishops, and ascetics, sanctifying the Christian order of Russian culture. 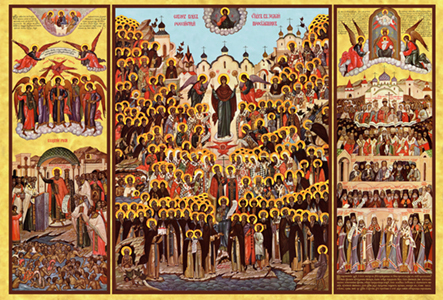 These were founded on the Christian principles set forth in the sacred Scripture and tradition of the Orthodox Church. Being realised in Russian national life in various degrees in various periods of history, these principles have continued to exist in all layers of the Russian people, from the Tsar to the last pauper, for the course of more than nine hundred years. They became our triumph and our glory as they passed from the Church Militant (here on earth ) and entered into the Church Triumphant (in heaven). They await us! They exhort us to follow them! In our times of the 21st century in the so-called free western world, the Christian principles have been replaced by antichristian principles….by satanic principles. Before our eyes duplicity and deceit have pulled down the last remnants of Christian culture…..by that same evil satanic force that was experienced in Bolshevik Russia with God-fighting atheism, and which ultimately seeks the destruction of mankind. The Devil, through his loyal servants, tries to uproot true faith and the Church. This is being carried out by the ruthless dismemberment of the Christian order of human life as formed by the Church, which has its beginning from the times of the apostles. Sometimes crudely, and sometimes in a devious and crafty way, all original faith and pious tradition, willed to us from ancient Christianity, is being destroyed. Satan, brazenly lifting his head, now triumphantly marches throughout the world, reaping for himself a bountiful harvest (of human souls, whom he aims to damn for eternity). The whole world now resembles the land of the Gadarenes, not wanting to be healed by the Lord/Healer and expelling Him away from itself. 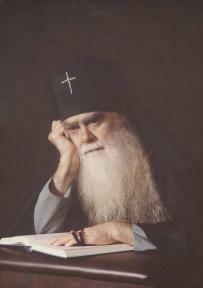 It is dreadful to think how few people there remain at the present time, who soberly look at the events happening in the world, honest and sincere people, not having sold their soul to satan for one or the other earthly benefit, not working wholly for their sinful passions and not demonically-possessed, like the vast majority. Dear brothers and sisters in Christ, let us look to Jesus Christ, the originator and accomplisher of our faith, Who, endured a CROSS, having despised the shame, and hath sat down on the right of the throne of God (Heb.12,1-2). Below is a video of the descent of the Holy Fire in the form of CROSSES on the Orthodox Pascha (Easter), 2015, in Jerusalem at the Tomb of Christ’s Resurrection. The form of the fire should remind all Orthodox Christians to carry their CROSS. This means patiently enduring all the personal sorrows of life, but especially, to confess the Orthodox Christian faith, without fear, false shame, or grumbling. 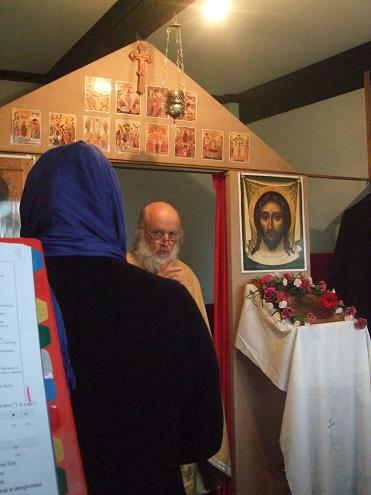 The first and foremost expression of our Orthodox Christian faith is faithfully attending the Divine Services. This we must do as often as possible, and at the very least, every Sunday. We also express our faith by keeping the fasts (at present - the fast of the Apostles), and by praying at home every morning and evening, and in our hearts, throughout the day. Furthermore, we express our faith by keeping the commandments of our Lord, and repenting sincerely when we fall short of fulfilling them, whatever the reasons are for such a fall. Contemporary life would like to tell us that all this is unnecessary. Modern life tells us to live for the body, for the present physical world, and for the material well-being of our children. But this is not a true Orthodox view of life. Every day we are faced with the decision: Should I act as a Christian, or should I rather choose what is “normal” in the eyes of the abnormal modern world? Brothers and sisters, let us learn what is NORMAL for Orthodox Christians. At every moment, we must be able to distinguish this from the “normal” abnormality of the modern world. 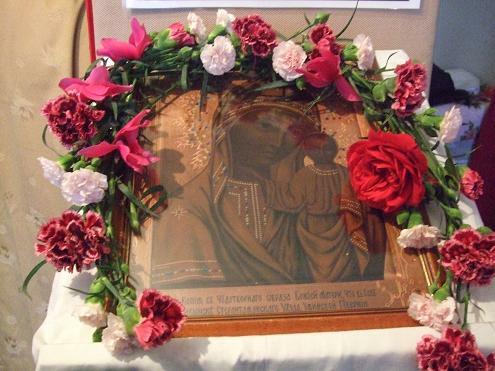 On Friday 30 May / 12 June, the community in honour of the Tabinsk Icon of the Mother of God celebrated its patronal feast with the services of Matins and Divine Liturgy. At trapeza, Abbott John read the historical account about the wonderworking Tabinsk Icon. Some of the parishioners shared their memories of the Icon and of parish and community life in the Russian community in China. They recounted how in the 1960s, when most of the Russians were leaving China, many wanted to take the Icon abroad to safety. However, some maintained it should stay. 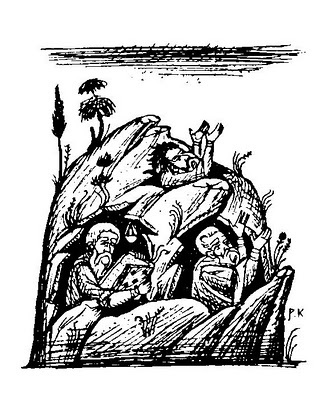 As a result, it is unknown what happened to the wonderworking Tabinsk Icon after the Chinese cultural revolution.